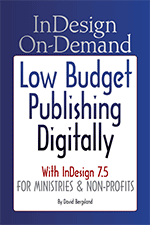 ← So: you need to provide ministry resources? The focus of this book is very sharp. It is designed for people who are designing books and booklets with very limited capital and few personnel resources. It is a sharing of techniques for the new wave of author/pastor/teacher/designers who need to get their work published digitally & online. It is designed to help those of you without the resources, connections, or the inclination to intrigue the large, mass-market media houses with their incredible capital requirements and marketing needs. This book will enable you to produce the books and teaching materials required by the vision you have been given. You no longer need a huge budget or years of production time to produce professional books distributed worldwide. If you do not do the book layout yourself, give a copy of this to your designer. This book teaches you how to write and publish a printed book, convert it to an ePUB, make a downloadable PDF, a Kindle book, and more. This is what you need to know. Radiqx Press provides help to ministries: Our vision is to enable ministers to have the tools necessary to produce the professional marketing materials required for their ministry. Teaching materials and techniques are shared to enable new ministries to make their presence known while budgets are still small. Plus, they show ministries how to be good stewards of their resources as the work grows and prospers.